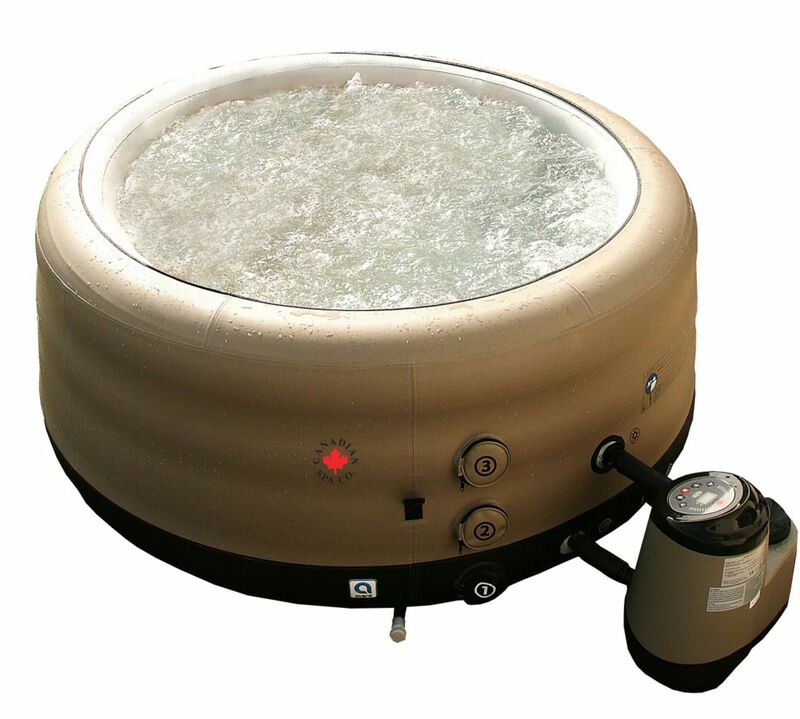 The Canadian Spa Company's Grand Rapids Inflatable Spa provides an extra-deep liner for added relaxation and enjoyment, and is designed for adults with its 29-inch depth, which will submerge your shoulders and add to your hot tub experience. Plus, the 1320W heater, 6-inch inflatable locking cover and included thermal blanket will keep your spa operating during the winter months. Grand Rapids 4-Person 29-inch Inflatable Spa The Canadian Spa Company's Grand Rapids Inflatable Spa provides an extra-deep liner for added relaxation and enjoyment, and is designed for adults with its 29-inch depth, which will submerge your shoulders and add to your hot tub experience. Plus, the 1320W heater, 6-inch inflatable locking cover and included thermal blanket will keep your spa operating during the winter months. Grand Rapids 4-Person 29-inch Inflatable Spa is rated 3.1 out of 5 by 15. Rated 1 out of 5 by Anonymous from Not Happy We had our hot tub less than a year and the pump went out. Canadian Spa replaced it with a refurbished one. Shortly after we set up the hot tub, the bottom ring started leaking air. We are still fighting that. Now our second pump is leaking water faster than we can fill the tub. We are not happy with this product at all. Would not recommend to anyone. Rated 3 out of 5 by Anonymous from Sarah This is a wonderful entry level hot tub! There is one problem though; the blow up coverleaks air and I can't find the leak. Very frustrating. Rated 2 out of 5 by mrwcmpsol from Initially I was very excited to receive this spa but as we were inflating it with the control cen... Initially I was very excited to receive this spa but as we were inflating it with the control center we found a 6-8" split in the liner at the top of the spa. This was way to big to even try and patch...thankfully Home Depot immediately offered a refund and arranged for UPS to pick up the spa. Also, as we were packing everything back up we noticed that the inflatable insert for the cover was missing. From the condition everything was in it almost looks like we may have received someone else's return item instead of a new spa. Be sure to check over the spa and the entire contents of the box before starting assembly. FYI this was shipped straight from Canadian Spas themselves, not an HD warehouse or store. Rated 4 out of 5 by leo from We love it! Putting it together was not too hard, but the directions were not clear enough. I think it's because it is sold all over the world with different languages, so they use symbols a lot. The video has no talking instructions, just music. When we got it together its works very well. It's advertised as a four person Hot Tub but they would have to be the size of small kids. Two people fit okay. The heat and bubble feature work very well. One other problem we ran into is when we run the hot tub the circuit breaker trips in our main panel box if we run our bed room air conditioner at the same time, so we will have to upgrade our panel box. Over all we are pleased with the Hot Tub. The main reason we purchased the Canadian Grand Rapids is it's the only one that is advertised as an all four season hot tub in this price range. Rated 5 out of 5 by Mwarren2 from "How did we ever get along without it!" "How did we ever get along without it!" My wife's quote on our first use of our new Canadian Spa's Grand Rapids Spa. Easy to set up even for this 65 year old retiree. Took about one hour from unboxing to fully filled with water. We've been using it for three weeks now with no problems or complaints. The heater actually goes to 107 degrees (ad says 104). When using the bubble system the heat loss is about 4 degrees per hour, but the heater does a very good job at fast recovery. Haven't seen how it has affected our utility bill yet, but it doesn't seem to run the heater much after the water comes to the set temp. We keep the filter circulating 24/7 and the water stays fresh with the 1 inch chlorine tabs we use. (Be sure to purchase a dispenser for your chlorine as one does not come with the spa.) All in all a great spa and one of the only portable spa companies currently shipping to California. We're glad Intex wouldn't ship to us because we feel this is a much nicer and better manufactured spa. Your mileage may vary but we are totally impressed! Rated 1 out of 5 by CummingDave from Don't waste your time or money I realize that this is a $600 spa and can't be compared to expensive spas; it should however work. This thing leaked air from the cover and sprung a leak upon first filling. It failed to heat to 104 even though the ambient temperature was in the mid 90's. Overall poor quality and poor design. The air inflator as holes in it which leak air when you try to inflate the top and the spa itself. I never could get it to inflate more than 27 inches despite working for an hour on the inflation. It won't hold heat because when the heater/filter turns on it blows the thermal blanket (a piece of bubble wrap) over to the opposite side. When trying to drain it to return it to HD I discovered that the threaded drain plug was larger than a standard garden hose. I had to use the short piece of plastic tubing that was provided which was too short to drain past the tub. Consequently, the water drained on to the outside of the tub and took forever to drain. Save yourself the trouble and headache and pass on this piece of junk. The Grand Rapids has 88 jets. The maximum temperature is 104f. Is this unit heated? If so where is the heater located? Yes, the portable control unit (PCU) with the heater, pump, and filtration system is located outside the tub to maximize on space inside. How noisy is this spa? The Grand Rapids has a quiet but powerful pump that generates bubbles. How wide is this hot tub on the inside (outside is 70&quot;)?